When it comes to determining the success of a school, we tend to focus our attention on the classroom–and rightly so. That’s why teachers and principals are often first to receive high praise for high student performance–and the first to suffer criticism when students struggle. But the path to student achievement starts long before students sit down in class. To succeed, students need to arrive to school on time, feel safe when they get there, and have the support of a highly-trained staff. That requires the hard work and dedication of school operations professionals who oversee critical divisions like transportation, facilities management, information technology, school safety, and other key aspects of a school’s overall climate. At TrustED, we talk a lot about the importance of a strong school customer experience. We focus on how school districts can equip administrators, communications professionals, and front office staff with the skills necessary to build strong and trusting relationships. Cultivating a strong customer experience is the responsibility of everyone in your schools, especially your operations team–from the school bus drivers who pick students up in the morning to custodial staff who interact with students and faculty throughout the day to the IT professionals who ensure learning and communication continues uninterrupted from the opening bell to afternoon dismissal. 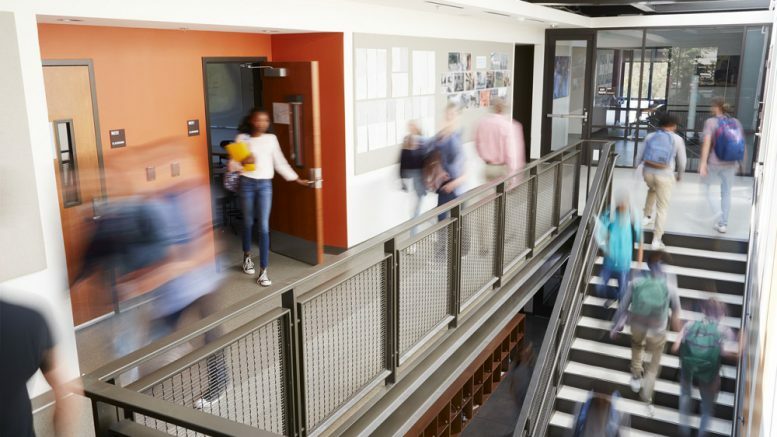 With this in mind, here are five school districts whose operations teams are succeeding at turning daily interactions with students, parents, and staff into exceptional and memorable customer experiences. School bus drivers are often the first and last school representatives students and parents see each day. 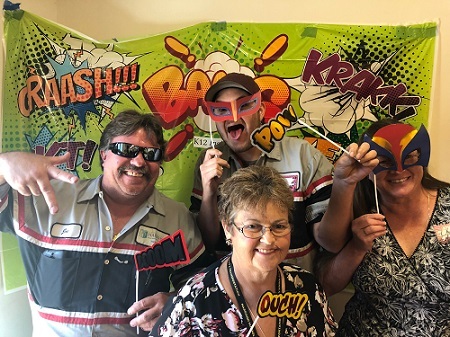 At Harrison County School District 2 in Colorado, administrators wanted to equip bus drivers and other transportation professionals with important customer service training and skills. So, the district held a series of customer experience workshops led by K12 Insight to train team members–from mechanics to bus drivers to dispatchers–on customer service strategies for everyday situations. 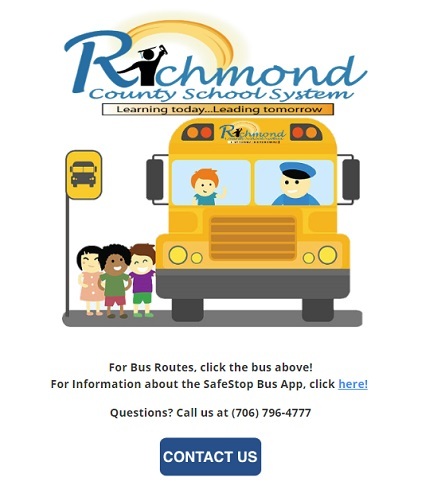 Richmond County School System in Georgia knew it had a lot of work to do to improve the customer experience around transportation when—in just one day—it faced more than 1,000 transportation-related inquiries from parents and community members. So they turned to Let’s Talk!, a cloud-based customer service solution from K12 Insight. Now, a custom button and form on the transportation department’s website enables community members to send inquiries directly to transportation officials. On the backend, the technology immediately routes it to the person best suited to respond and makes it easy for users to collaborate within or across teams for a timely, accurate response. 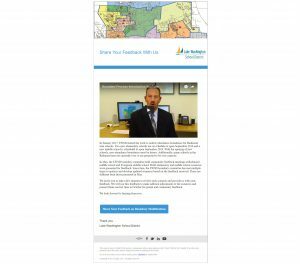 “One of the things that I like as an administrator is the dashboard component,” says Dewayne Porter, senior director of transportation for the district, “where I can see how we’ve done as far as responding and the feedback that we get,”. To hear the full story, don’t miss our exclusive on-demand webinar with members of the RCSS team. After seeing success using Let’s Talk! to better engage its school community, administrators at Youngstown City School District in Ohio set their sites on improving internal-facing customer service. A backend data dashboard presents district leaders with key metrics about the quality and status of each engagement—such as number of inquiries, average response times, and customer satisfaction score. School leaders use that data to understand and inform school climate and customer experience. A key charge of any operations department is ensuring a safe and secure school environment. Manor ISD in Texas wanted to improve its approach to school safety–specifically around bullying. Though the district previously had a strong bullying awareness program, it needed better reporting. That’s when they considered using Let’s Talk!. 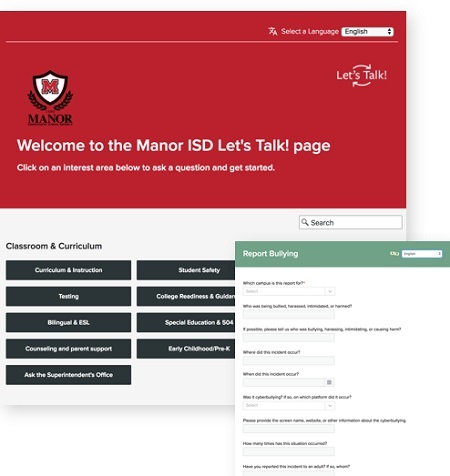 To hear how Manor ISD and other school districts are using Let’s Talk! to prevent bullying, check out our exclusive on-demand webinar. Facilities management and maintenance is one of the most important responsibilities of any school operations department. But, making decisions about changing school boundaries, closing old schools, or building new ones, is never easy. Lake Washington School District in Washington has gone through multiple boundary changes over the past six years to meet the needs of its fast-growing community. But with several schools at or near capacity — and the opening of three new campuses thanks to a $398 million bond passed in 2016—administrators faced another boundary modification process. Administrators used Let’s Talk! to inform community members about the process and took them to a landing page where they could pose questions and learn more about each boundary proposal. Each scenario featured a brief video that walked community members through the changes and their potential impact. Then, with the help of Let’s Talk!, community members could fill out an online form and share thoughts, questions, and concerns directly with district officials. The process resulted in a more positive boundary process than the district had seen in the past. Want to see how K12 Insight and Let’s Talk! can help your operations team contribute to a culture of customer experience? Sign up for a free consult. Be the first to comment on "5 districts doubling down on school customer experience"